This article is no longer up to date and needs to be updated with new information from Halo: Legacy of Onyx. You can help by updating this article. Sarcophagus, formally designated as Shield World 006, or Shield World 0006, and also referred to by Forerunners as the Sharpened Shield, and as Quarantine Safeguard is a massive Forerunner shield world in the Zeta Doradus system. Having been previously located within the artificial planet Onyx, the shield world is often still referred to as Onyx. When the shield world came under UNSC control in 2553, it was given the name ONI Research Facility Trevelyan (ONIRF Trevelyan) in honor of the late Kurt Trevelyan, but as the human and Sangheili presence there expanded beyond what research was being conducted by ONI, "ONIRF Trevelyan" became less associated with the shield world at large, now referring more specifically to the ONI installation on its surface. 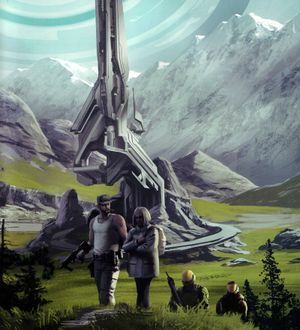 By April 2554, the sphere had come to house the joint UNSC-Swords of Sanghelios Onyx United Research Project and contained a growing settlement with a population in the thousands. Sarcophagus is a Dyson shell, a massive artificial structure encircling a star. At approximately two astronomical units or 300 million kilometers in diameter (corresponding roughly to the diameter of Earth's orbit), and weighing approximately 1.37 solar masses, the sphere is by far the largest known megastructure created by the Forerunners. According to Dr. Catherine Halsey's calculations, the internal surface area of the sphere is approximately 500 million times the surface area of Earth, or around 255 quadrillion km2. Despite its massive size, while inside the artificial planetary shell of Onyx, the structure was contained inside a slipspace bubble of compressed dimensionality, making its apparent diameter only about 23 centimeters. The observed portion of the interior surface of Sarcophagus is rolling hills and verdant forest, with several Forerunner cities in between. As the Forerunners never arrived, the shield world is entirely maintained by Huragok and Sentinels, including cylindrical drones tasked with monitoring for signs of Flood infection. The Dyson sphere's default environmental conditions are suitable for Earth-based life, but the climate settings could be adjusted for other species' requirements. The sky inside the shield world appears solid blue; the landscape on the other side of the sphere is not visible as a result of the shield world's enormous scale, unlike on smaller shield installations such as the Etran Harborage. However, the concave curvature of the horizon can be detected with a telescopic sight. The exterior surface of the sphere is dark brown in color and entirely featureless, at least in the area around the only known entrance. There are two identified Forerunner facilities on the shield world. The Citadel is an urban habitat that served as the base camp for Blue Team for the majority of their time in the shield world. Another section is essentially a garage filled with numerous Forerunner transports and vehicles. The Sarcophagus also contained a control room. It was in this section that Lucy-B091 discovered several Huragok maintenance personnel, and successfully communicated with one of them. Numerous other structures are scattered around the landscape, including towers responsible for environmental maintenance and atmospheric control. Some of the structures are home to slipspace portals which link not only to locations within the sphere, but also other worlds, including Hesduros. However, since the status of many of the facilities in the portals' receiving ends is unknown, travel through them was advised against by the Huragok. One such portal led to the nearby planet Mackintosh which acted as the home port for a Forerunner warship of unknown class. While contained in slipspace, access to the shield world could only be obtained through a small portal located inside an antechamber in the core of the artificial planet Onyx. The portal was only active for a limited amount of time after the Halo Array had been put into standby mode. Some time after the portal had been deactivated, the Huragok crew transitioned the shield world back into normal space once they had been assured that there were no longer any threats to the shelter. In the process, the shield world enveloped the three inner planets of the Zeta Doradus system, which now orbit inside of it. The shield world could be returned to slipspace as a measure of protection against invasion. When the shield world was returned to its slipspace bubble, it had the side effect of dragging along the orbiting planets. The most technologically impressive of all shield worlds encountered in the modern era, Sarcophagus was constructed as part of the Didact's shield world defensive plan before the Forerunner-Flood war. This shield installation in particular was designed as a fallout shelter from the Halo Array, a competing strategy advocated by the Builders. Several slipspace portals on the interior of the structure were linked to major Forerunner worlds, in order to facilitate their evacuation before the Array fired; one such world was Kelekos. Another led to the planet known as Mackintosh in the same star system which acted as the home port for a Forerunner warship. Near the end of the Onyx Conflict on November 3, 2552, Covenant Fleet Master Voro Nar 'Mantakree led his forces in an attempt to access the Sharpened Shield. However, Lieutenant Commander Kurt Ambrose detonated a pair of FENRIS nuclear warheads within the core room antechamber after his comrades had passed through the portal, denying the Covenant access. The human survivors; Dr. Catherine Halsey, Senior Chief Petty Officer Franklin Mendez; Spartan-IIs Linda-058, Kelly-087, and Fred-104; and Spartan-IIIs Lucy-B091, Tom-B292, Ash-G099, Olivia-G291, and Mark-G313, were then seemingly trapped within the shield world. Shortly thereafter, the installation's Sentinels destroyed the artificial surface of Onyx. All that remained in realspace was a 23-centimeter orb around Zeta Doradus. When inside the shield world, the human survivors eventually managed to establish contact between the ONI ships outside the sphere, which had already detected the cyclically fluctuating anomaly caused by the slipspace bubble but had no means to access it. In February 2553, the shield world was brought back into normal space by a group of Huragok that the Forerunners had left behind to maintain the structure. There was a considerable difference in the passage of time between the slipspace bubble and real space; while the survivors inside the sphere had only experienced several days, approximately three months had passed on the outside. Once the Sharpened Shield had been brought back into normal space, the ONI team Kilo-Five entered the sphere. A strip of multi-colored lights activated to guide their dropship to the designated coordinates, where they would land on the surface of the shell. After a momentary blackness and a disorienting sensation for the occupants, they found themselves and their ship inside the "garage" facility. Halsey, Mendez and the surviving Spartans were then rescued from the shield world, but the doctor was immediately arrested by Captain Serin Osman for "committing acts likely to aid the enemy". Immediately afterward, ONI established a base of operations near the access portal to the sphere, which was named "Trevelyan" in honor of Kurt-051, whose sacrifice allowed humanity to access it. ONI's research facility was used to gather information on the vast installation, as well as to obtain usable Forerunner technologies. Days later, the former Shipmaster Jul 'Mdama, detained by Kilo-Five, was placed in captivity on Trevelyan at the behest of Dr. Irena Magnusson in order to use him in ONI's experiments; however, several days later, the Sangheili escaped via a local slipspace portal. The incident resulted in ONI commander-in-chief Admiral Margaret Parangosky personally relieving Dr. Magnusson of duty and replacing her with Hugo Barton as the facility's director. By March 2554, the shield world's fledgling research facility had undergone major changes, having become a combined effort between the UNSC and the Swords of Sanghelios. A settlement known as Paxopolis had been established in the sphere and was steadily growing, primarily housing researchers and their families. Franklin Mendez, former head instructor for the Spartan-IIs and Spartan-IIIs, was appointed as the facility's head of security, alongside Sangheili Kasha 'Hilot. A number of Spartans were assigned to the facility's garrison. Shortly after March 30, 2554, Spartan-IIIs Lucy-B091 and Tom-B292 joined the security staff, serving directly under Mendez. By 2558 the UNSC and the Swords of Sanghelios had a strong military presence on the shield world which included hundreds of soldiers, combat vehicles and even warships. This military strength was necessary to protect Paxopolis from the constant siege from both Forerunner constructs and dangerous animals, as well as from external threats. With the beginning of the Created conflict, the UNSC-Swords of Sanghelios forces on Onyx had it returned to Slipspace as a form of protection against Cortana and her Guardians, taking with it the three planets that had been left enveloped within the shield world when it emerged from slipspace. At the same time, it faced an invasion by the Servants of the Abiding Truth. After the destruction of a Created Guardian, the Servants retreated to a new base on Mackintosh to bide their time. Following the establishment of the research facility, numerous discoveries of records and technology were made within the shield world. Significant finds included the Bornstellar Relation; the remains of a Catalog carapace, (designated "Forerunner remains #879"), including the desiccated, malformed corpse within; a fossilized Juridical accompanied by a monitor with an account of the last days of the Forerunner-Flood war; and the personal armor of a latter-day Forerunner Prefect. All of these discoveries were studied extensively, with the Bornstellar Relation and the monitor's accounts giving a great deal of insight into Forerunner history and society. Matériel discovered on Trevelyan soon led to new technological developments, such as a variant of MJOLNIR (GEN2) that ONI's Watershed Division and local Huragok reverse-engineered from the Prefect's armor. Initially, one of the Trevelyan site's primary purposes was to experiment on genetically modifying the Sangheili grain known as irukan, with the goal of creating a bioweapon to be unleashed against the Sangheili as a backup plan in the event ONI's strategy to destabilize them failed. To accelerate the growth of the crops, ONI had the facility's resident Huragok create slipspace bubbles in which time passed faster than in normal space, much like the dimensional bubble the shield world itself used to inhabit. With the advent of the Onyx United Research Project and the joint UNSC-Sangheili occupation of the sphere, the bioweapon project within the facility would presumably have been discontinued. The "Sharpened Shield", a name used for the shield world in the Halo Encyclopedia, was originally a fan-made name used on Halopedia. The name had never been used in any official Halo media, though it was seemingly based on the line, "And bless the Reclaimers that may take refuge behind the sharpened edge of the Shield," from Halo: Ghosts of Onyx. For more information, see this discussion. Collectively, the designations "Shield World 006" and "Trevelyan" are a reference to the James Bond film GoldenEye, in which Alec Trevelyan, the film's antagonist, is a former 00 agent with the code number 006. ↑ 9.0 9.1 9.2 9.3 9.4 9.5 Halo: Fractures, "Lessons Learned"